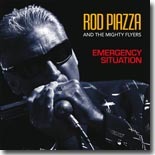 The appearance of a new CD from Rod Piazza & the Mighty Flyers is a welcome sight. It's been too long since the last one, which makes Emergency Situation an easy choice for this month's Pick Hit. Vaneese Thomas' tribute to her late father, Rufus, drew raves from two of our reviewers. Blues For My Father is our Surprise pick for the month. Stony Plain Records hits us with a double dose of fine blues with compilations from Joe Louis Walker and Long John Baldry. The two albums comprise this month's Flashback feature. Our What's New section features reviews of new CDs from Mannish Boys, Selwyn Birchwood, Deanna Bogart, Andy T - Nick Nixon Band, Ronnie Earl, Dave Specter, Janiva Magness, Too Slim & the Taildraggers, The Nighthawks, Kelley Hunt, Dudley Taft, and more. Wow, what a month!